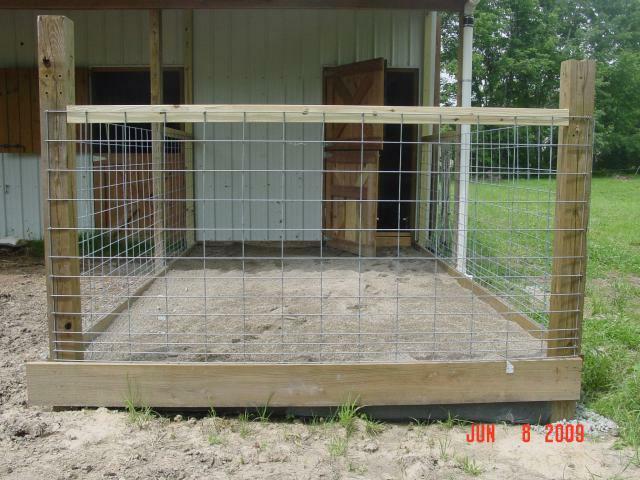 This is our almost finished chicken coop. 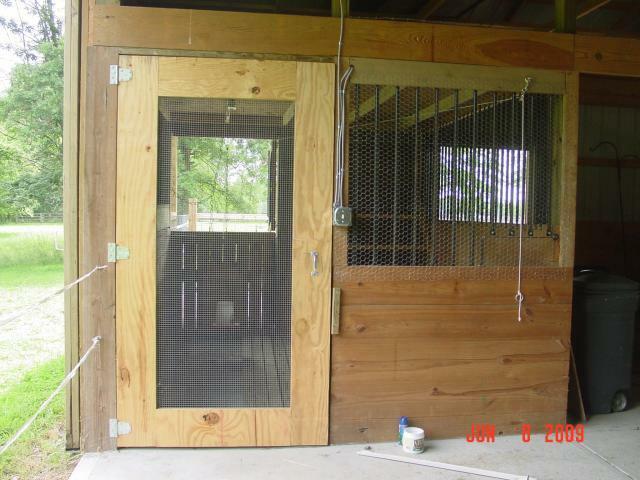 It is a converted stall in my horse barn. 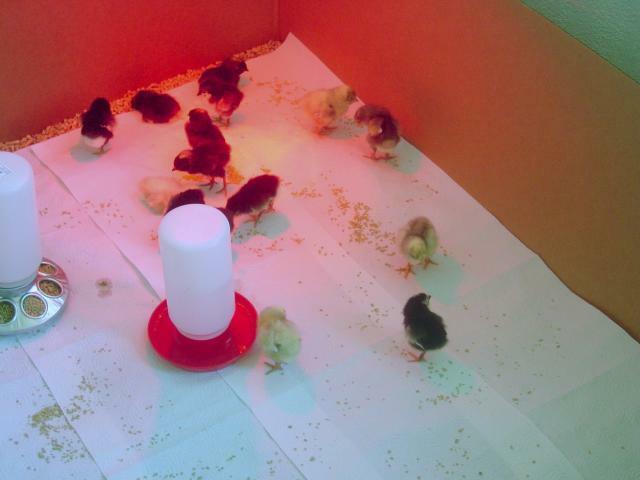 It will house 16 chicks. 6 Barred Rocks, 5 White Rocks and 5 Black Australorps. 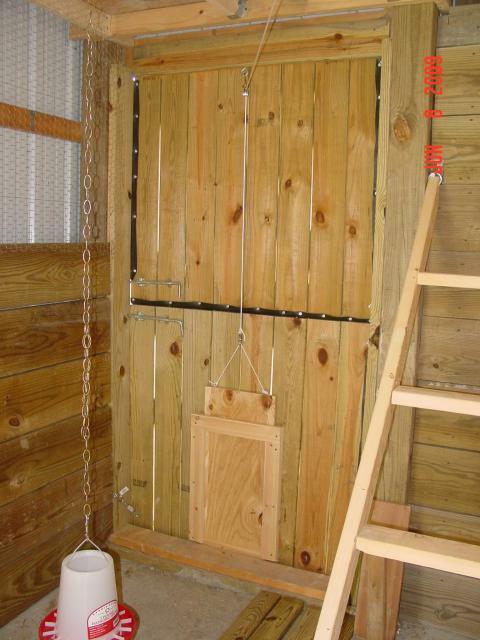 The coop itself is 10 x 10 with an attached run of 10 x 16. The floor os the coop is concrete. The run footing is a base layer of #2 rock, which is large rocks anywhere from 3-5" in size. On top of that, we put regular sized gravel without any dust. The final layer is sand. 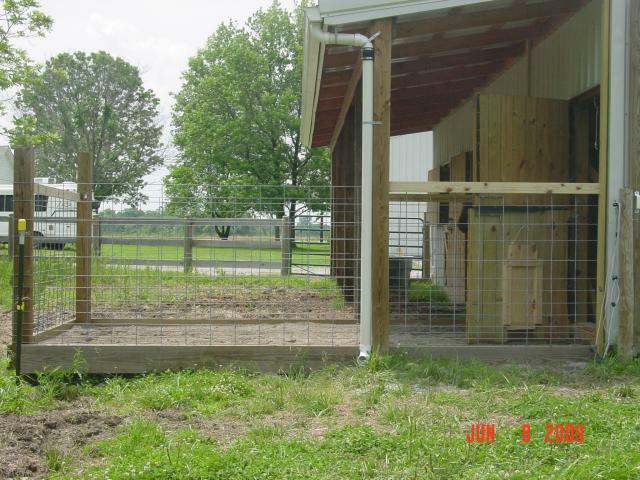 Where we live, in the wintertime, the water table is right below the surface, so the ground stays very wet and muddy. 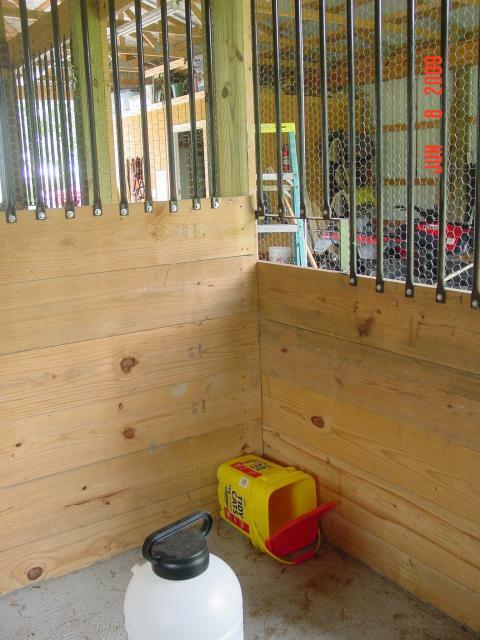 Plus the coop is on the downhill side of the barn. So we knew we had to build up the run so the chickens could use it all year. To hold the footing in on the end of the run, I screwed hardware cloth to the botton board and bent it in, then lined that with landscape cloth so the sand would not filter out, but the water would still be able to escape. I think this should work out very well for us. Now for the pictures. 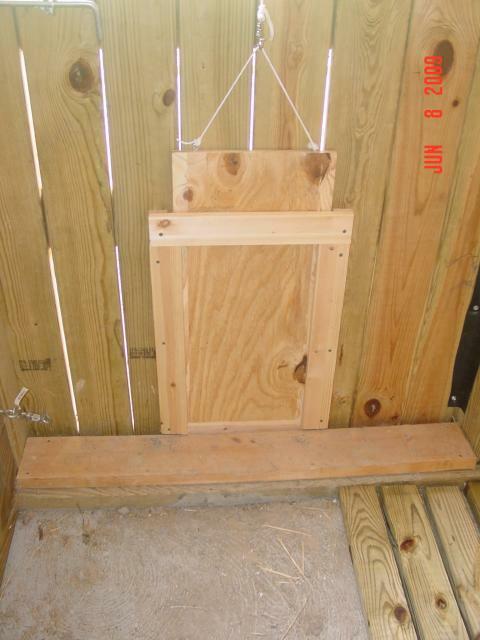 It's hard to tell in some of the pics, but the top of the coop, where the black bars are, is completely covered with chicken wire and the door is make of hardware cloth. It just doesn't come through in the pics very well. 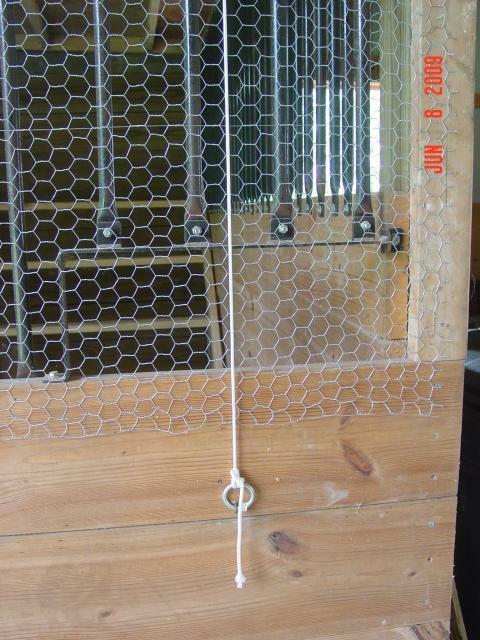 The coop door fron the inside of the barn. Where the nesting boxes will eventually go. 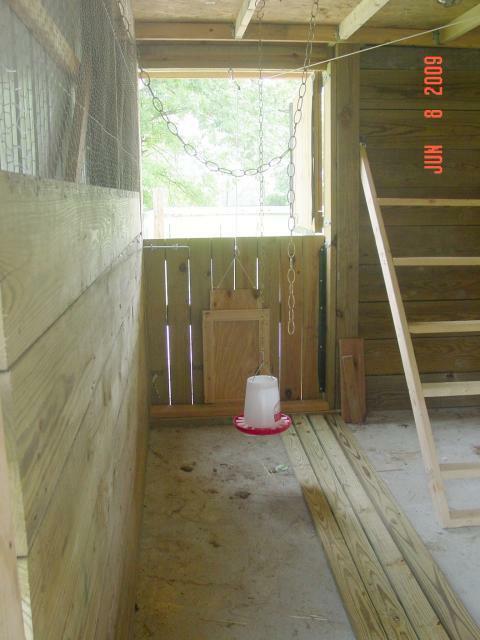 I am probably going to use either 5 gallon buckets or the kitty litter boxes. Haven't decided yet. Dutch doors with the pop door closed. Close up of pop door and tracks. 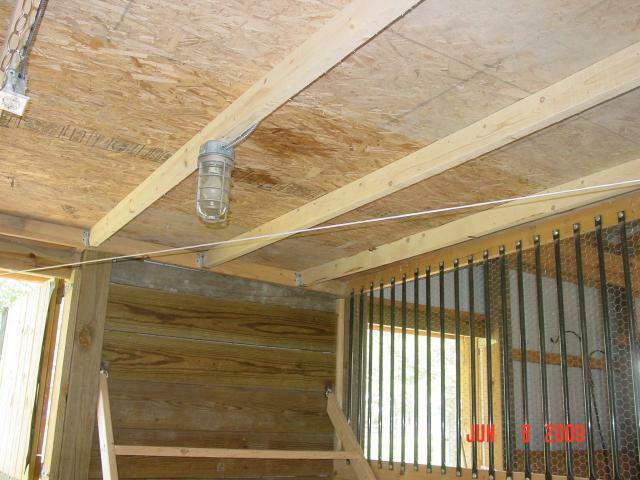 Ceiling showing the light, plug and pulley rope for the pop door. I wanted the plug in the ceiling in case I need a heat lamp in the winter. Hook for the pop door pulley. I wanted to be able to open the pop door without going into the coop. This worked out perfectly. Dutch door with the top opened. 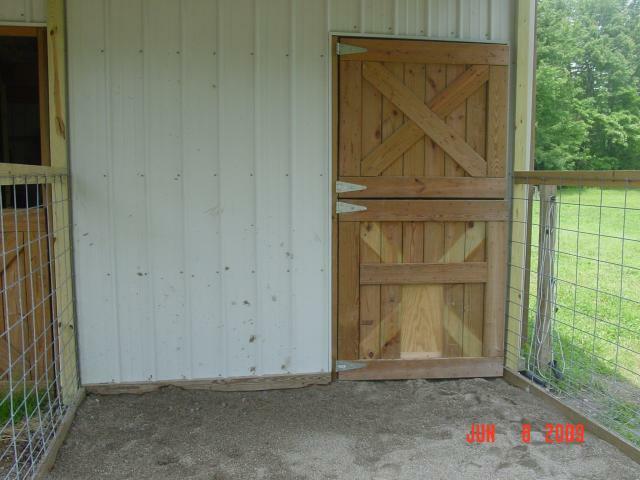 The dutch door from the outside. You can see where I had to take the X out of the middle of the bottom door to make a big enough pop door. From the end of the run facing the coop. 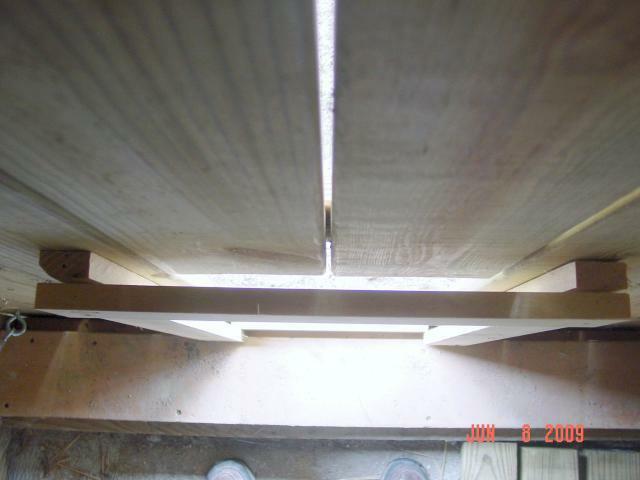 You can see how unlevel the ground was where we put the 2 x 10. I wanted to make it wo the water drained, so we put tons of rock under the sand. I will be lining the current fence with hardware cloth at the bottom and regular chicken wire around the rest to keep anybody from being grabbed and pulled through. 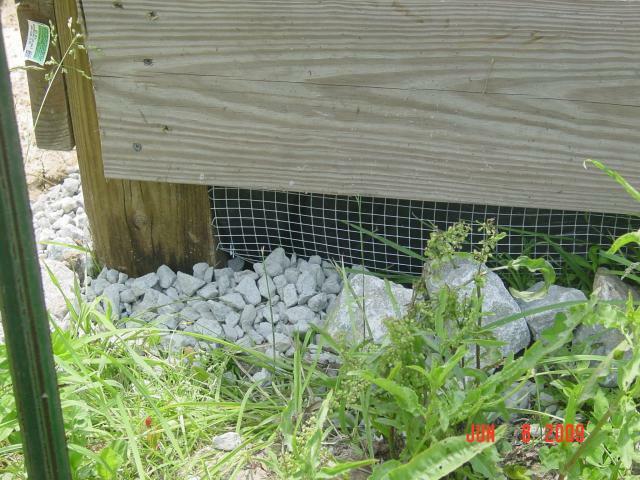 I will also be using either garden fence or chicken wire to make a cover for the run. 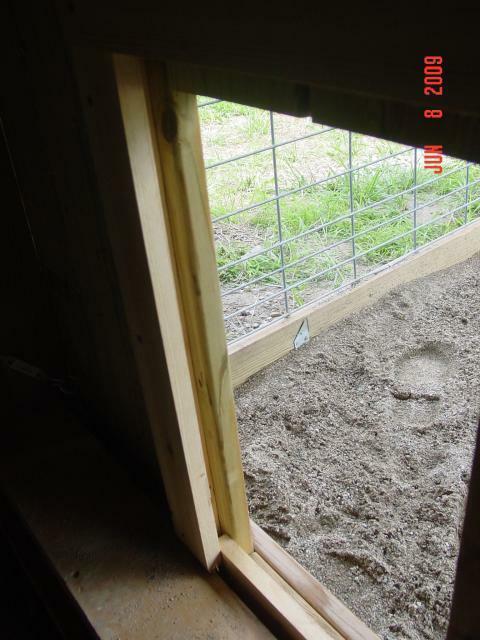 It will be completely closed in before I let the chickens out. The run from the side. You can see the overhang where they will be able to get out of the sun if they want. Hardware cloth and landscape fabric holding in the gravel. I will eventually have more of the big rock piled around so the hardware cloth doesn't bend out or break. 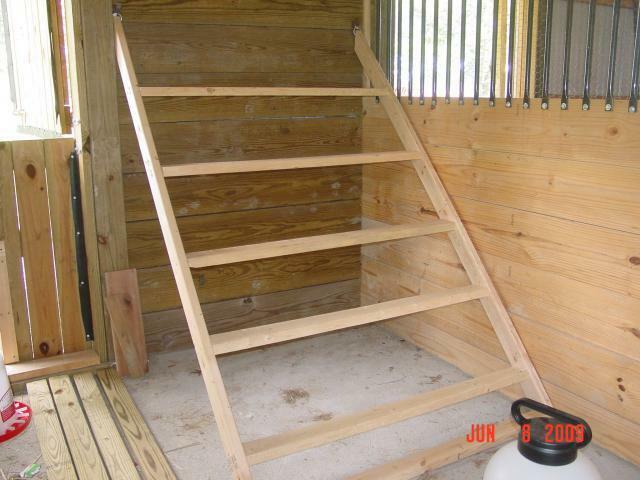 "Great way to repurpose existing structure!" Great repurposing!!! Love the outside "porch" area! Great for shade and protection from the weather ( and a spot for humans to relax). I'm curious on how the 16 birds will do with the perch system. My "kids" always vie for the highest spot in my set up. Nice explanation of each picture. Good job on both the coop and the run. 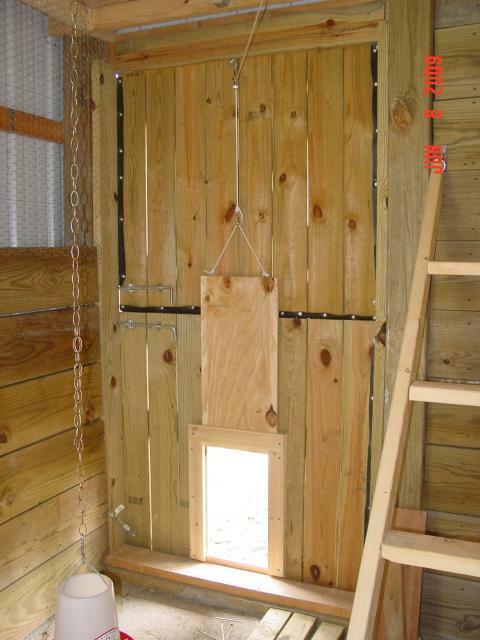 I like your overall design of your coop and the pop door is a great idea. I would expand the run; it is a little on the small side. Your roost system is good, also. I would definitely make sure that you keep ease of access in mind. You did a good job with that, but future builders should consider it. Your ventilation is this coop is really good too! Super nice build and great job documenting it. How big is your pop door? We did the same thing! They move into it in a week!